Color Pencil Drawing of Deer! HomeSketch of a DeerColor Pencil Drawing of Deer! 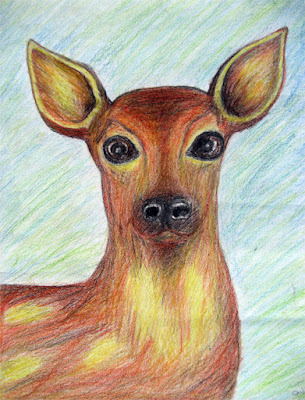 In this post, I am sharing with you the color pencil drawing of deer. This drawing of the deer is done on a A3 (24.5 x 34.5 cm) sized chart paper using only the color pencils. This sketch portrays only the head of the deer. I love the easiness, comfort and flexibility of color pencils. They are quite handy. Express your views about the color pencil drawing in the comments below! Hello, since you haven't entered your name I can't say whether I have shown it to you or not. This drawing of deer is three years old, at least, and hence I don't remember much about it now. Thank you for appreciating my arts. I'll be publishing my next art soon. Hope to get your comment again but with your name!